Campsites includes 70 hookups, five tent sites and ten park models rentals. Bear Cave is the only cavern in the Great Lakes area. It was formed in “tufa rock” which is a secondary limestone. It is estimated that this particular bed of rock is at least 25,000 years old and is resting on a glacial drift deposited during the last ice age approximately 50,000 years ago. 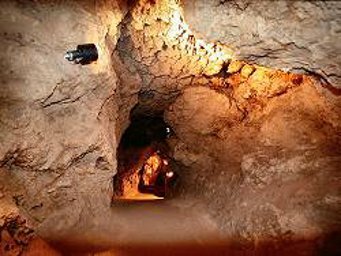 Along the 40 foot winding stairway that leads visitors through the cave you will see stalactites, petrified leaves, and other peculiar shapes. The metal oxides of native ores color the entire cave. The cave measures 15 feet deep, four to six feet wide and 10-15 feet high. The cave holds quite a bit of significant history. It played a significant part in the Underground Railroad during the period of slavery. In 1875 the “loot” from an Ohio bank robbery was “deposited” in the cave. This became the inspiration for the 1903 silent film The Great Train Robbery. The film is now considered a silent film classic and was the precursor of the thriller movies of today. The cave is entered through the gift shop. It is open from May to October and there is an admission fee. Call for hours open.